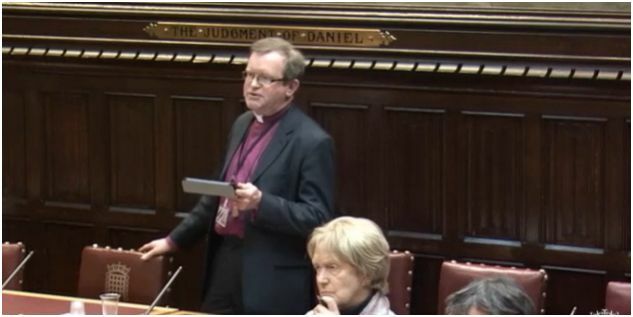 The Lord Bishop of Portsmouth: My Lords, in contributing to this debate and responding to the Chancellor of the Exchequer’s Budget Statement last week, to the subsequent events and to the debate in the other place, I welcome some proposals, express some surprise, and register disappointment—indeed, shock—at some of the measures announced. First, it is good to congratulate the Chancellor and Government on the intention to raise the tax free personal allowance to £11,500 this time next year. Lifting about 1.3 million people out of income tax is, of itself, welcome, although there are some potential drawbacks to which I will return a little later. The decision to extend the period in which the 3% stamp duty second-home premium can be reclaimed is a real encouragement to those to whom I have previously referred, particularly elderly people, who want and need to downsize for their own well-being and comfort—and who, in doing this, also release a family home—but for whom the challenge of moving out and in coincidentally, or close to it, is too demanding and stressful. The pay first with reclaim up to three years later approach is not ideal and is hardly an encouragement to downsize, but it deserves some welcome. The commitment to HS3 between Manchester and Leeds, the road tunnel between Sheffield and Manchester, the widening of the M62 to four lanes, and the backing for Crossrail 2 in London are all to be applauded as significant investments in infrastructure for the country. The announcement of a further £20 million over two years for the First World War centenary cathedrals repair fund has been enthusiastically received. Both my See city’s cathedrals have benefitted from this fund already; indeed, 54 of the 59 eligible English cathedrals have done so. A grant of more than £680,000 went to my own Cathedral of St Thomas of Canterbury for essential work on the tower and south transept, in particular. I was surprised, though, to read in the Red Book’s announcement of an examination of cathedrals’ financial sustainability, that these 59 glorious places of worship are described as a “sector”. Cathedrals are not a sector of the economy like SMEs, banks or the leisure industry, but the vibrant and active heart of dioceses, cities and communities, with growing congregations, witness and service, as the statistics show. They do not form a sector either of the economy or indeed of anything, and while I recognise that a collective noun for cathedrals is not easy to find—suggestions are welcome—it demeans their present and our faith heritage to call them a sector. My second surprise was the announcement of a consultation on the provision of and facilities at crematoria made in the Budget, of all places. While issues about the number, location and size of crematoria are important, they cannot be addressed in isolation from others involved in ministry and provision at and around death, such as churches, ministers and funeral directors, if the stated aim is to be fulfilled, responding sensitively to relatives and to people of all faiths. Our surprise at the announcement that all schools must become academies was again that it was made in the Budget, but there is now clarity on the timescale, albeit that it is challenging for everyone. The Church of England, as the provider of 4,700 schools and the largest provider of academies, will use its expertise and its collaborative partnerships to ensure that no one is left behind, especially small rural and coastal schools where the challenge is greatest. Our foundation for educational leadership will help to deliver what is most needed: leaders with vision and skills. I turn to the disappointments. Sooner or later, a Chancellor must address the issue of pensions. It cannot be skirted, avoided or ignored. In particular, I draw the attention of the Minister to a consequence of the raising of the income tax threshold which, by removing people from paying income tax, also removes the tax incentive to provide for their pensions. These are issues that will not disappear and must be addressed. Ten times in his Budget Statement the Chancellor used the word “generation”. It is clear that he is not unaware of generational issues, but every reference was to the next generation. Intergenerational considerations are ones of morality and equity. Each person in each generation of every age is of value and is a full member of society with privileges and responsibilities. It is not right to ignore the generational issues that confront us not only with regard to our children and their children, but which are the responsibility of those of us who are near or beyond retirement age. We are specifically protected, insulated and exempt from the austerity that has characterised recent Budgets. Protection, insulation and exemption all have their place in national economic policy, but burdens must be borne fairly. Members of the Government have frequently echoed the words of the present Chancellor in his first Budget—that those with the broadest shoulders would bear the greatest burden of austerity. Not for the first time after recent financial statements I have examined the tables, both official and those in the newspapers, which detail how much various individuals, couples and families would gain or lose from the Chancellor’s decisions. This time, the tables are more striking and chilling than ever. In the Times table, for instance, of 72 different sets of circumstances only eight households face a decline in income, and that of just 37 pence per week. Every other individual, couple or family gains up to more than £400 per year. However, we know that there were, and are, losers. The outgoing Work and Pensions Secretary, responding to Andrew Marr on his Sunday morning show—I need with haste to clarify that I viewed it on iPlayer, as I was otherwise engaged on Sunday morning—said that he was not in the business of morality; he left that to churchmen. Although I disagree because ethics and morality are for us all, I respond to his challenge and invitation. It surely behoves us to examine not only the gain and loss tables but our consciences. Given our circumstances and ages, I doubt that many Members of this House will be worse off through the Government’s proposals. The tortuous saga of the last week finally led yesterday to a clarification—that is the politest term I can use—from the Chancellor that the Government had intended that the losers would not be those with the broadest shoulders, but the vulnerable or disabled. That decision was morally indefensible. Having accepted the error, I trust that all of us will be willing to set our course—and the Government their economic course—with a stronger moral compass. Lord Newby (LD):…I have a suggestion for the right reverend prelate the Bishop of Portsmouth. I would have thought that a see of cathedrals might be a good collective noun. 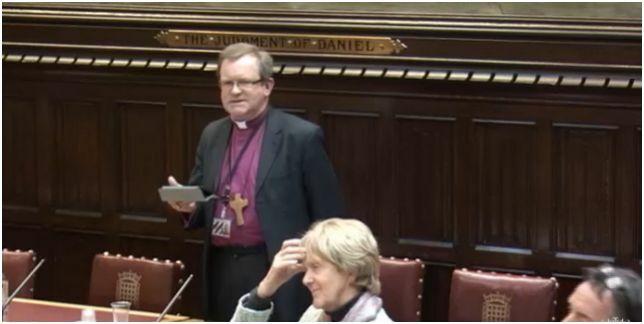 Lord Davies of Oldham (Lab):..as the right reverend Prelate the Bishop of Portsmouth argued, we should have a concept of morality in what we do. It cannot be right that this Budget increases inequality in our society. It rewards the wealthy and condemns the less well-off to an uncertain position and limited resources. That is why we are critical of it. Lord O’Neill of Gatley (Minister): I want to respond to the right reverend Prelate the Bishop of Portsmouth. He made a very important comment about simplification and the speed with which words can be used. I will certainly take that note back to my colleagues and I hope that is something we can address in the future.